Gremolata is a condiment made from finely minced parsley, garlic, and lemon zest. It's great because it adds brightness and aromatics to dishes like braised meats that might otherwise be a bit heavy or one-note. It's traditionally served with veal, especially the classic braised veal dish osso buco, but it'll also go well with lamb, and it's an excellent accompaniment to fish and seafood dishes. With the addition of a glug of good olive oil, it's also a terrific marinade. Alternatively, with the olive oil and a splash of flavored vinegar, you've got a lovely and refreshing salad dressing. The parsley and garlic need to be chopped pretty finely, and all this chopping can be a chore. You might be tempted to toss all the ingredients in a food processor and call it a day, but that wouldn't be a good idea. For one thing, if you've ever tried to chop parsley in a food processor, you know that, instead of chopping it, it turns your parsley into a wet, stringy mess. For another thing, the food processor really rips up the garlic, causing it to release sulfur-based compounds that produce intense heat and a bitter flavor. A good way to mince the garlic, instead of using a knife is to peel the cloves and then mash them with the tines of a fork. First, mash them one way, and then turn the fork 90 degrees and mash the other way. 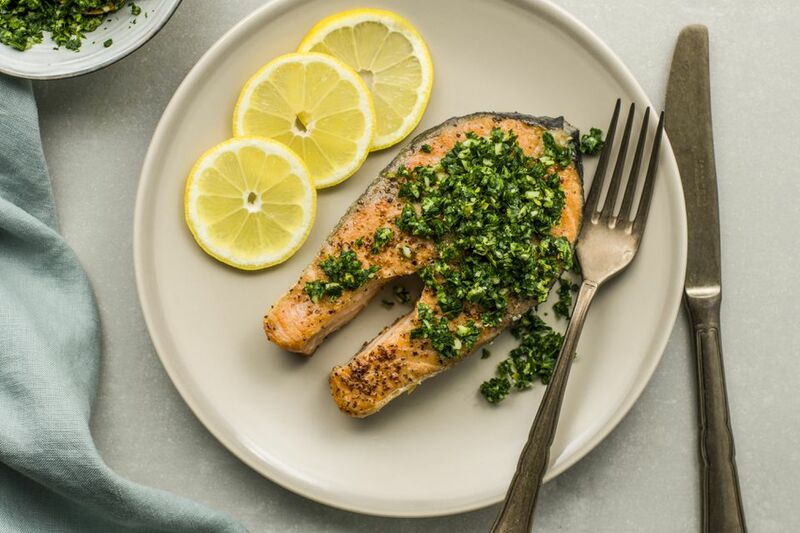 You'll notice that gremolata is a lot like pesto, and just as there are variations of pesto, you can get creative with your gremolata as well. Try substituting different greens for the parsley, like basil, cilantro, mint, or spinach. Some chopped scallions, ground peanuts, or even fresh horseradish can kick it up in different ways. Wash and thoroughly dry the parsley. Remove the leaves and finely mince until you have about 2 tablespoons worth. Use a lemon zester to remove about 1 teaspoon of lemon zest. Combine all the ingredients in a bowl and season to taste with Kosher salt and black pepper. You can pound the ingredients together with a mortal and pestle or just use the back of a spoon or the bottom of a glass. Serve as garnish for your fish or veal and enjoy!